Tareptepism is the Dynamic art of fusing influences: An art of fluid movement ever changing and evolving through the matrix where the art and the artist dwell. Like water it is ever flexible and boundless. TAREPTEPISM capturing motion from environment and capturing the dynamism of emotion. Tareptepism, contrary to futurism, is pro nature. Tareptepism compares to surrealism, surrealism is more on dream while tareptepism is more on hallucination. Compares to realism,; imperfection as to realism while inconsistency as to tareptepism. The waves, the wind, the streams, formation of leaves, ripples of water are some of the elements that inspired tareptepism. It is an illusion of motion. The illusion of motion is what gives worthy paintings impact, hypothesized Baler, Aurora self-taught visual artist Vincent Christopher Gonzales. 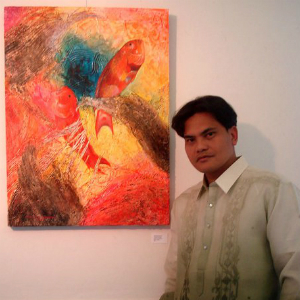 He suggested to elder brother Sherwin Paul Gonzales, who is an award-winning visual artist having exhibited in three continents in 2014, that they create an art movement based on this principle. As a truly indigenous Filipino art style was missing, Sherwin suggested to give it a Filipino name from the initial Illusionism or Motionism as they coined to call it. Since they are from Baler, they decided to name it Tareptipism from the old Tagalog word tareptep, which means ripple of water, waves being the art principle’s denominator. And Vincent turned Tareptipism’s most prolific exponent. Tareptipism is… blue and green scattering more strongly as orange and red flash, giving the horizon brilliant and beautiful glow akin to an optical illusion. It turns into a highly textured and colorful abstraction trees in bright and warm neon color of a Baler landscape overlaps a seascape with rolling big waves pulsating with the rays of light and energy brought by the wind. Then Vincent asks not what makes a philosophy but rather the more intriguing question: What makes an artist’s philosophy? Vincent chooses to do art because this is what makes him happy. He subscribes that every artist has a goal that defines him. “My ultimate goal is leave a legacy not only to my family or country but to humanity as a whole,” he summed up. ”Rizal in Europe”, Palazzo Medici Ricardi, Florence Italy, June 29, 2014. ”Tareptepan Arts and Music Festival”, Costa Pacifica Hotel, Baler, Aurora, Philippines June 28, 2014. ”Rizal in Europe”, Chelsea Gallery, Chelsea Old Town Hall, King’s Road London, UK, June 25, 2014. ”Rizal in Europe”, MOYA (Museum Of Young Art) , Palais Schonborn, Vienna Austria, June 21, 2014. ”Rizal in Europe”, Schaffhausen Tourism Hall, Herrenacker Schaffhausen, Switzerland. June 19, 2014. ”Rizal in Europe”, Burgplatz, Essen, Germany, June 14, 2014. ”Rizal in Europe”, Ontmoetingshuis De Brug, Hertshage, Belgium, June 7, 2014. ”Mandala Tres”, Robinson Mall, Pulilan, Bulacan, Philippines May 11, 2014. “Opening Kapampangan Art Center”, Paskuhan Village, San Fernando, Pampanga, Philippines February 14, 2014. “Grand opening” , An Binh Gallery, Crescent Mall, Ho Chi Minh City, Vietnam, September 15 to October 1, 2012. “Amang Bayan” SM City Sta Mesa, Manila, Philippines June 11 – 13, 2010. “Korea Philippines Art Exhibit 2010” GSIS Museum, Pasay City, Philippines February 26, 2010. “NEW ART COLLECTIVE” , Art Association of the Philippines and The Artery Manila, Botong’s Up Restobar and Artspace, Makati City, Philippines January 26, 2009. ”Tiwala at Kapaligiran”, Dimalangat Arts Movement, Bistro Baler, Philippines June 15, 2008. “Kris real Tv” ABS CBN, host: Kris Aquino. “Executive Class” ANC- ABS CBN, host: David Celdran. Segment “Obra” TFC – ABS CBN. “Motorcycle Diary” GMA 7, host:Jay Taruk. “I love Pinas” GMA 7, host: Carlo Lorenzo. “Balitang Europe”, TFC- ABS CBN, 5x. “Life style Network” ABS CBN, host: Karen Pamintuan and Walter de Mesa. “Something to Chew on” Solar News Chanel, host : Xandra Rocha.